The Traveling Wilburys show that magic can happen . Beatles Radio: The Beatles, Solos, Covers, Birthdays, News The Fab 4 and More! Thirty years ago, an album called The Traveling Wilburys appeared and quickly went platinum. It had four famous singer-songwriters and one famous producer-musician performing under stage names. It was the work of George Harrison. 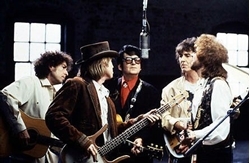 The actual story of the Wilburys album captures what can happen when a group of talented artists gathers, often by chance, at a certain time when everything is right, the stars are lined up, and the creativity is focused. In April 1988, Harrison needed to record a B-side for a European single. There was a deadline issue and Harrison asked Bob Dylan for the use of his Malibu studio. Tom Petty and Roy Orbison joined them, and with Dylan cooking barbecue, Harrison instructed the musicians, including producer Jeff Lynne, to make up words to his chords.